If you've read the latest article from Michael Ramsey in the Wall Street Journal you may have noticed that LeafOwner.com was mentioned! Big thanks to Michael for taking the time to setup a phone call and interview me (Chris Hammond) for his article. I don't know if the article will be made public or not, right now it's available to subscribers only unless you find it through Google News (though that only works some of the time apparently based on my testing). Here's a screenshot of the original article (only the section mentioning LeafOwner as I don't want to reproduce the entire article). So here we go, this post has been a week coming, I just haven't had the time do get it together. About a month ago, perhaps a little more, I did something that seemed to upset quite a few people, even apparently some people at Nissan! 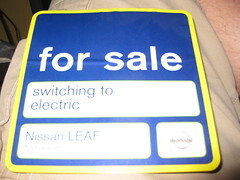 I posted the opportunity to buy my Nissan Leaf on Ebay. That lasted all of a few minutes, I’m not even sure how long the auction was up 24 hours before I was asked to (or really it was suggested that I ) remove it. So down it came, along with the posts that I had put up announcing it. What people didn’t know was that I had been posting the Leaf on craigslist here in the bay area for a month or more before it was ever listed on Ebay. I had a few inquiries from the Craigslist ad, though many of those inquiries were just your typical internet trolls complaining. Some even took the time to email me and call me an “Idiot” I appreciate that someone took the time to do that. So back to Ebay, I pulled the ad, I removed the blog/forum posts, I cleared most of my tracks at the threat of losing the right to purchase the Leaf. I even quit posting the ad on Craigslist. After the ad came down from Ebay people started coming out of the wood work asking to buy the car. Fortunately for me I had lined someone up before I even pulled the Ebay ad down. In fact the ad didn’t even have anything to do with getting rid of my car, the Craigslist ad came through. What? I thought you purchased the Leaf last week? Well, technically I did, for a little while anyways. I had a guy fly in from Detroit on Monday of last week, we drove from the airport to the dealer, then the bank, then the dealer again. The dealer wouldn’t take a cashier’s check, so we had to go to the bank and have the money wired from their bank, to the dealer’s bank, which was all of 1 block away. Unfortunately the dealer’s bank became a problem and wouldn’t show the transfer as posting until the following day. So in order for us to drive the car off the lot that day I ended up having to take a loan out on the car as a fall back contract, in case the transfer didn’t go through. So there it is, I no longer own a 2011 Nissan Leaf? Why might you ask? Well it really doesn’t matter what I say, people are going to hate on me. But here goes my explanation with a little backstory. Back in April of 2010 I got an email from Nissan announcing the preorder process for the Leaf, I jumped on things and signed up, immediately preordering as soon as I could. Shortly after that I setup www.LeafOwner.com with the thought of creating a website dedicated to the Leaf. I got some good traffic, with the help of some key features on Engadget, AutoBlogGreen and even two different tweets from Lance Armstrong! I was thrilled at the idea of getting a Leaf, I have an 8-9 mile commute, so it was going to work out perfectly for that. I was one of the first people to get the Aerovironment charger inspections, I asked my landlord if we could get an install going. From there things actually started to sour a bit. I got the charger assessment back and it was for $2200, roughly $800 for the charger/shipping, and then the rest for the installation, for about an hour’s worth of labor and maybe $100 worth of equipment. As the summer progressed I kept up with the Leaf, attending events to see the car when I could, and then went through the ordering process, that is when things really went south for me. I went ahead and ordered the car, as a lease option, but when I started thinking about it, the lease was going to be $420 a month. I started thinking, 420 a month could go towards a very nice car payment, rather than “renting” a very expensive Nissan Versa. I’ll take some hits for that, but to me that is what the car ultimately became. It’s an economy sized hatchback, that when fully priced out last week was $38k. While there are lots of cool geeky features in the Leaf, the only real addition above and beyond a Versa was the batteries, the electric aspect. So I decided that the car most likely wasn’t for me. In October I went to the driving events that Nissan was doing, and that pretty much sealed the deal for me. I drove the car, and after driving corvettes, camaros, and 350zs I just couldn’t see myself driving the Leaf, not at the cost. I’m a car guy, I always have been, and the later it got into 2010 the more I had the itch to start racing cars again. I am now actively autocrossing my 350z (www.project350z.com). Heck, for the price that the Leaf ultimately cost I could have purchased a brand new 2010 Nismo 370z! Though I didn’t want to do that either, spending more money just wasn’t in the cars right now. My 350z cost me $12k, and that’s a lot smaller car payment than a new Leaf would be, and the car ultimately becomes more useful to me as I can autocross it. So in the end, to sum things up. The price of the electric car killed it for me. I’m not saying I will never own another Leaf, or an electric car, but right now it just didn’t make sense to me. In the future I do hope to own an electric car, heck maybe I’ll build an electric VB Bug for www.projectvw.com in the future. But for now, I’ll let the early adopters help to bring the price of the electric car down. For those of you who choose to hate me for that, I am sorry that you feel that way, but that’s the beauty of our wonderful country, everyone gets to have their own opinion. So I got an email from Boardwalk Nissan earlier this week that my car was in! The website said it would show up the week of the 8th, came in early! I'm going in on Monday afternoon with the money to purchase it. Here are some photos I took of it sitting on the floor today. So all the details are yet to be published, or even decided based on what I have been told, but we should all plan a little gathering on Saturday in San Francisco, to welcome the first Leaf owner in the world (for a production Leaf, not a preproduction model) who will be getting his Leaf earlier in the day. We'll be gathering around 1:30pm at a location yet to be announced somewhere in the city (SF). I'll have more info by Friday, if not sooner. I'll edit this post with details when available. First Leaf coming to NorCal on 12/11? So Autoblog is reporting that the first Leaf is going to be delivered in Northern California on Saturday the 11th. Something tells me that is definitely going to happen. Anyone else got any news? I wonder who it will be, and what Dealer it will be at? Reviving the dead, The Leaf is Coming! So for those of you who have been around since the early days of this site (April 2010), you have likely noticed things have died down a bit. That's not because there hasn't been any Leaf news as of late, just that life got in the way! I had my first child a month ago and have been enjoying everything that has brought me. I have been logging into the Nissan site every couple of days to see if I had an estimated delivery date, and I'm glad to say that I finally have something! 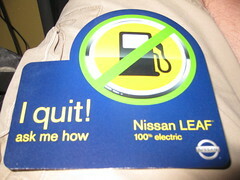 The site tells me I should see the Nissan Leaf sometime in the month of January! So that's exciting, does anyone else have an estimated date yet? If so, when? I hope everyone got to take part in the Nissan Leaf Driving Tours that are going on, I went to the event in San Jose on the 30th, I took a load of photos, they've been up on the site for a while now, but in case you haven't see them you can find them with the URL below. 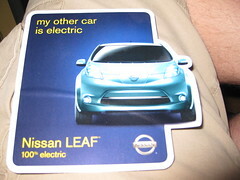 Did anyone else get some Nissan Leaf Decals in the mail today? I received these, kind of cool, though disappointed that they are all bubbling off without me having even attempted to use them. So, all completely unofficial of course, but it looks like Lance Armstrong is getting his Nissan Leaf next week, according to a tweet he sent to @leafowner earlier today. I wonder when Steve Jobs will get his? Hopefully not before Lance! Nothing like last minute notices..
Today only, from 11am-1pm there will be a Nissan Leaf at Boardwalk Nissan in Redwood City. You can visit, take a look, and I hear even sit in it. I might head down over lunch and take some photos, haven't quite decided yet. If you're interested in test driving a Nissan Leaf get ready. Nissan just posted a schedule for events that you can sign up to drive the cars. You have to RSVP, and it doesn't look like all the events are open yet. "Hi Chris. We have some exciting news. You can now request a quote* from your local Nissan Dealer and place an order for your Nissan LEAF™. We appreciate your support of Nissan LEAF, and we're happy to say that you'll soon be one step closer to owning one. To get started, click below." Nissan's Innovation for All Campaign, Polar Bears coming! FRANKLIN, Tenn. (Aug. 25, 2010) – Nissan North America, Inc. (NNA) today announced a significant new marketing initiative to showcase the strength of Nissan’s innovative product portfolio and build on 10 straight months of sales growth for the Nissan brand in the U.S. market. The campaign, to be headlined under the theme “Innovation for All,” will launch on Aug. 28 and permeate a variety of medium and targets over the next several months. “Innovation for All” will begin with a series of five television spots that capture Nissan’s history, track record and process of innovation. The campaign features the full line of Nissan products – from the 100-percent electric Nissan LEAF and Altima mid-size sedan to the Z sports car, Titan full-size pickup truck and cube ® activity vehicle. The versatile campaign also will appear in print and online with a consistent look and feel. The campaign, developed by longtime partners TBWA\Chiat\Day Los Angeles, depicts Nissan’s innovation through a series of stories that are in turn whimsical, heartwarming, technology-minded, spirited and poignant. “We’re sharing Nissan stories that are as exciting, intelligent and innovative as the brand itself,” said Rob Schwartz, chief creative officer, TBWA\Chiat\Day Los Angeles. · “Innovations” – A celebration of Nissan’s current innovations, including smart phone apps, recycled materials, air purifiers, the Juke – the world’s first Sports Cross – and the 100-percent electric Nissan LEAF. · “Baby” – A soon-to-be dad transforms his 370Z into a Maxima sports sedan for the arrival of his first child. · “Kidzilla” – A little boy’s toy car collection endures a beating, from dog-chewing to water plunges, but the Nissan Altima remains unscathed – just like in the real world. · “Dime” – One of the most important safety innovations that Nissan delivers in every new car is its brake override system. This ad shows that a Nissan truly can stop on a dime. Sept. 9 marks the debut of “Polar Bear,” a highlight of the “Innovation for All” campaign as it previews the Nissan LEAF – the world’s first mass market, affordable zero-emission 100-percent electric vehicle. In this story, a polar bear journeys from the icy Arctic through forests, highways, train tracks and over bridges to the big city and then on to the suburbs, where the animal finds someone who is trying to help – the owner of an all-electric Nissan LEAF. The “Innovation for All” campaign represents a significant marketing initiative for Nissan, aiming to deliver over 200,000,000 media impressions before the end of 2010. In North America, Nissan's operations include automotive styling, engineering, consumer and corporate financing, sales and marketing, distribution and manufacturing. Nissan is dedicated to improving the environment under the Nissan Green Program 2010 and has been recognized as a 2010 ENERGY STAR® Partner of the Year by the U.S Environmental Protection Agency. More information on Nissan in North America and the complete line of Nissan and Infiniti vehicles can be found online at www.NissanUSA.com and www.InfinitiUSA.com. I was told by the GM that there would likely be no test drives before they get a demo vehicle in December, I sure as help hope that isn't true. Nissan has been saying driving tours will happen sometime this fall. Myself and a buddy headed down to Plugin2010's public night down in San Jose this evening. To be honest, there wasn't much to be learned there, though there were a few interesting things to see. They had the usual blue Leaf that has been around California a few times now (I've tracked it down and photo graphed it twice), though tonight was a little different. There were no red ropes this time, so people could get right up on the car. It was mostly unlocked, but they weren't too happy when people opened the doors (I swear I didn't! but saw a few try). The car was cleaner than when it was out on display in the open as I've seen it before, though had a number of finger prints on it by the end of the night. They also had the various accessory lights on, see some of my photos for those. 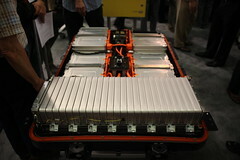 Nissan also had a battery pack on display, that was cool to see. 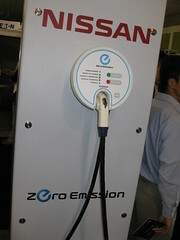 In addition to the Nissan info, there was an AV Charger there on display, I got a number of photos from that. In addition to the AV charger on display there were a TON of other chargers available. 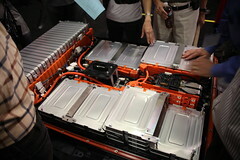 I talked to one of the Coulomb Tech reps for a bit (I think he was a founder of the company) and he seemed to talk like their charging units (mainly the free ones) would only be made available to the GM/Ford/Smart car buyers, not to Nissan Leaf buyers, but we'll see how that plays out. Since they are local I am hoping to reach out to them again soon and see what more info they can provide. the 100% electric Nissan LEAF tour will commence Fall 2010. the tour will feature a test drive* for LEAF reservation holders, information on public charging infrastructure and home charging options. tour dates and locations will be communicated in September. Good news today on the Nissan Leaf front! They bowed to the pressure from all of us at LeafOwner.com (kidding of course) and went with a 8yr 100k mile warranty for the leaf! SAN JOSE, Calif., July 27 /PRNewswire-FirstCall/ -- Today, nearly 17,000 future Nissan LEAF drivers are learning when the world's first affordable all-electric, zero-emission vehicle will be available in their markets. Consumers who have placed reservations for the Nissan LEAF received a communication today regarding market timing and next steps in ordering the all-electric vehicle. Nissan LEAF first will be available to consumers in December, in California, Washington, Oregon, Arizona and Tennessee. These areas are home to The EV Project – the largest electric vehicle and infrastructure deployment ever undertaken. The EV Project is a result of a partnership with charging infrastructure provider ECOtality and partially funded by a grant from the U.S. Dept. of Energy. Customers in these first five launch states, who represent more than 55 percent of total Nissan LEAF reservations, will be able to place firm orders for the Nissan LEAF starting in August. Nissan North America also is informing its consumers that the lithium-ion battery pack that powers the Nissan LEAF will carry a warranty of 8 years or 100,000 miles – matching U.S. market competitive conditions. Consumers who have reserved the Nissan LEAF online will be invited to place orders through their dealer for the vehicle in advance of market roll-out timing, allowing time for consumers to select a dealer and assess home charging needs. 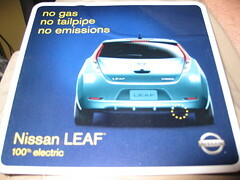 Nissan is continuing to take reservations for the Nissan LEAF through its website, www.NissanUSA.com. Interested consumers are encouraged to place a reservation, which entails a $99 fully refundable fee to secure a spot on the list to place an order. * Favorite color: The favorite color of Nissan LEAF owners is blue. More than 30 percent of reservations are for blue Nissan LEAF electric cars. Silver is a close second, at about 26 percent. The remaining reservations are close to evenly split among red, black and white. * Trim level: About 75 percent of Nissan LEAF orders are for the SL trim level, which adds a rearview monitor, solar panel spoiler, fog lights, and automatic headlights. * Home and Parking: About 75 percent of people who placed reservations own a single-family home. About 68 percent have attached garages, while an additional 18 percent have detached garages or carports. Home ownership and dedicated parking are important factors for Nissan LEAF drivers who plan to charge their vehicles at home. * Purchase time: About 67 percent of Nissan LEAF reservations holders have indicated that they'd be ready to purchase or lease a Nissan LEAF within one year of placing the reservation. An additional 24 percent indicated they would be ready in one to two years. * Interests: Several primary interests are inspiring people to order a Nissan LEAF. Cited interests include energy independence (35 percent); environmental consciousness (34 percent); and cost/fuel economy (20 percent). In North America, Nissan's operations include automotive design, engineering, consumer and corporate financing, sales and marketing, distribution and manufacturing. Nissan is dedicated to improving the environment under the Nissan Green Program 2010, whose key priorities are reducing CO2 emissions, cutting other emissions and increasing recycling. 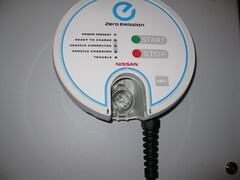 More information on the Nissan LEAF and zero emissions can be found at www.nissanusa.com. 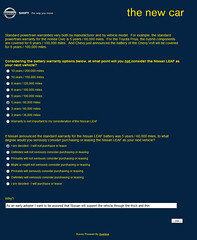 Nissan sent out an online survey asking about warranty and battery life for the Nissan Leaf. From reading through the survey it looks like they are considering 5yr/60k warranties, or 8yr/100k warranties. There is definitely a lot of information in the survey, and they ask a lot of "what would it take to make you not buy a Leaf". I was pretty strict on I won't accept a 5yr/60k mile warranty, I have no interest in the risk of being an early adopter of the Nissan Leaf if they aren't going to back the product with a very rigid warranty. What was your overall response to the survey? Did you get it today? Did you fill it out? What do you think the Warranty should be? I don't know about the rest of you, but LeafOwner.com will definitely be checking the event out. Plug-In 2010 Exposition Opens To The Public Get Plugged Into the Future of Transportation! 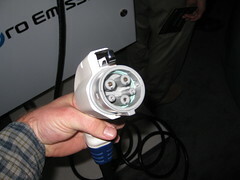 Charged up about plug-in hybrid and electric vehicles? Curious to learn more and check them out yourself? As major automakers announce plans to bring these vehicles to market, get your own first-hand look at a variety of cleaner and greener cars that can lower fuel costs, greenhouse gas emissions and our dependence on oil. Preview the very latest vehicles and other plug-in technology innovations at the Plug-In 2010 Public Night, and then take part in a panel discussion about your role in bringing plug-ins to market. Tickets can be purchased at the door for $10. For more information on Plug-In 2010 and to view our list of exhibitors, visit www.plugin2010.com. Vehicles scheduled for display (subject to change) include the Chevrolet Volt, 2010 Ford Escape Hybrid, Mitsubishi i MiEV, Nissan LEAF, 2010 Prius Plug-In, the smart fortwo electric drive, a range-extended electric chassis, a plug-in hybrid passenger car and more. It was a great day for future leaf owners down in San Jose. 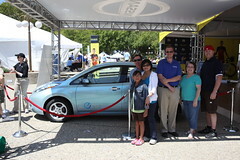 A group of us met up at the LiveStrong Challenge event going on down there today and tomorrow to check out the Nissan Leaf that was on display. Fun was had by all, though MsLusty is still there trying to find the Tailpipe on the Nissan Leaf. I got down there around 10am and started testing out the camera on the Leaf. The Setup was similar to what they had at the Amgen Tour Of California back in May, though they tweaked the layout a bit. Lighting wasn't great for photos today, way too much sun on half the car, and none on the other half of the car, but I tried to make due. Lunch was provided by Brendan from Boardwalk Nissan, a huge thanks to him for that! Word he was able to pass on as well is that Boardwalk will not be marking up the price on the Leaf over MSRP! That's great news for all of us in the Bay Area looking forward to buying from boardwalk. With the help of the lunch Brendan provided we managed to talk the reps into opening the Leaf up for us to take some photos of in inside, something that wasn't possible at the Tour of California. At the end of the day those of us remaining posed for a group shot outside of the car. Check out all the photos we took at the event, and possibly look for them via some other venues soon! So today we headed out to the meetup we organized at the LiveStrong event in San Jose, it was a great day catching up with some fellow leaf enthusiasts, I'll have a full review of that event and photos posted later today. 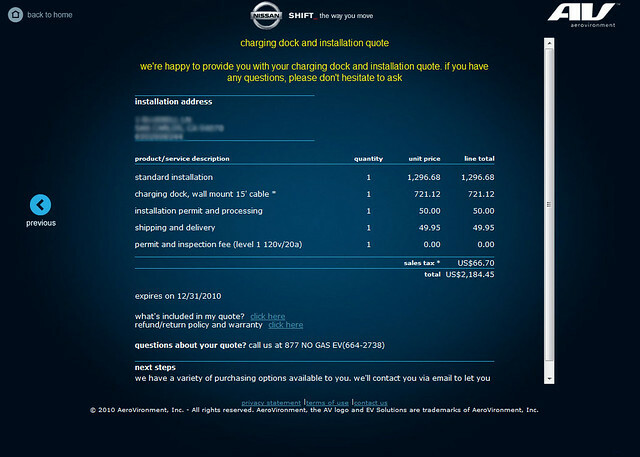 For now though, check out the Nissan Leaf Charger Quote I just received. I got an email saying it was completed, and I was able to login to the Nissan Leaf website to retrieve the quote. and a screenshot from the website. So after yesterday's exciting day here on Leafowner.com we've got another first for you! Check out Lance Armstrong's new Nissan Leaf ad. Lance is starting off on the Tour De France on July 3rd, best of luck Lance! All the Nissan Leaf fans will definitely be rooting Team RadioShack along!